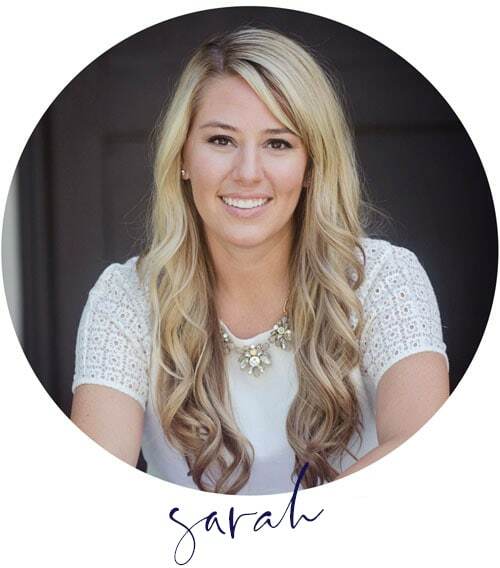 Now that the calendar has officially flipped over to April, I feel like it’s appropriate for me to talk all things warm-weather related! Easter today and maybe pool floats tomorrow 😉 I’m actually working on wrapping up this year’s spring home tour to share with you soon. 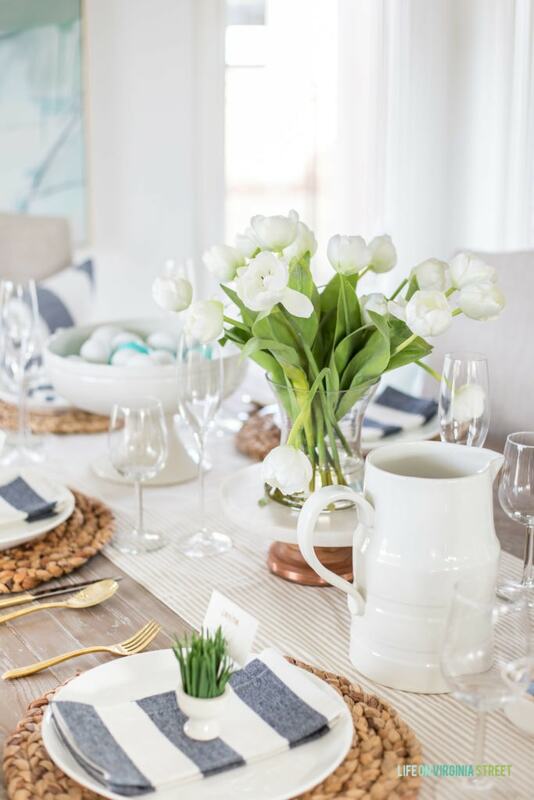 But in the meantime, today I’m sharing my striped Easter tablescape with you for a bit of spring entertaining inspiration! 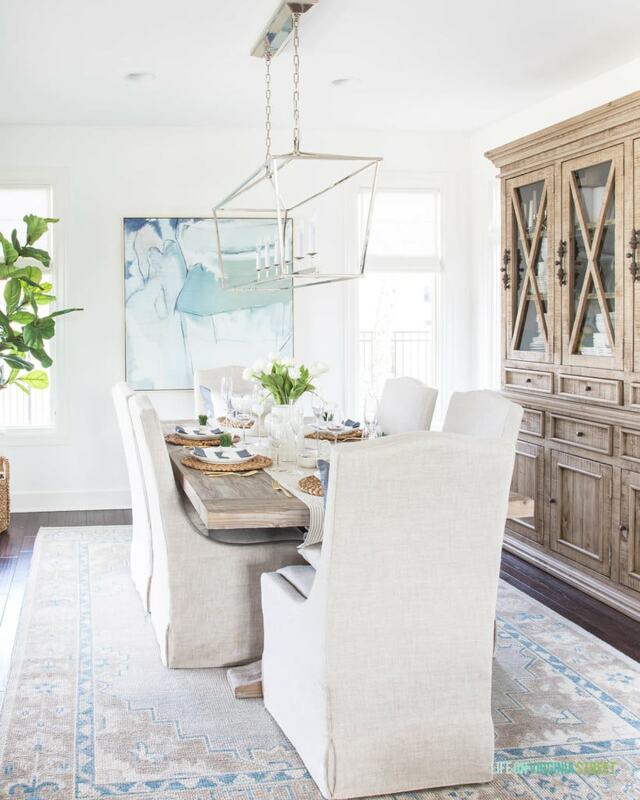 I always love decorating our dining room for the various seasons! It’s one of the few areas where I decorate a little extra without feeling like I have decor strung all over the house. For Easter this year, I was even a bit more excited than normal thanks to our abstract art. It’s the first Easter it’s been here and it feels even more perfect for spring and summer! Our hutch is still one of our favorite pieces of furniture. I love that it’s beautiful but also an incredibly functional storage piece! 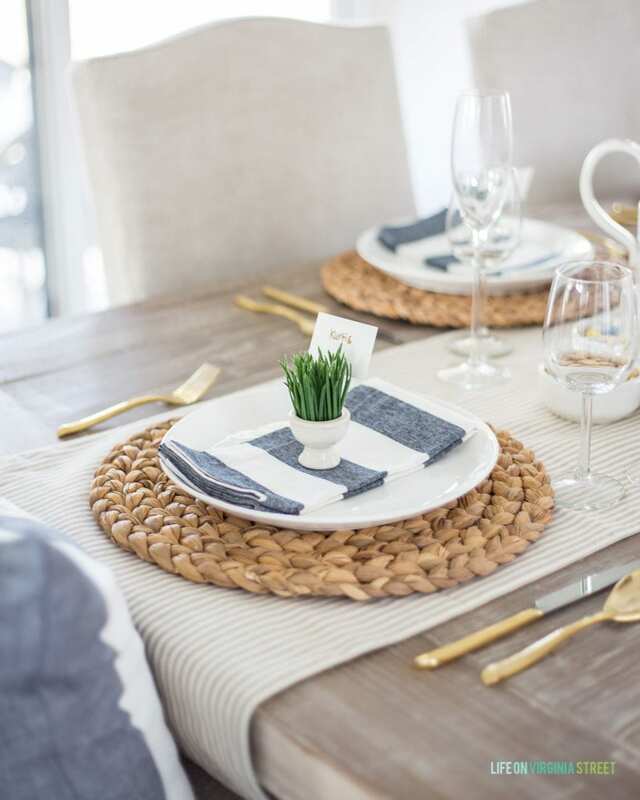 As always, I kept our tablescape fairly simple with a lot of basics I can use year-round! This little corner off to the left of our dining room before you walk outdoors is one of my favorites now! We’ve surprisingly kept it junk free and the buffet table helps serve as a small hosting station for overflow food, napkins, drinks, etc. I also love the glimpse of the dining room you see in the mirror reflection when you walk down our entryway hallway! I added the topiary and tray for spring! It’s the same tray we have in our kitchen near the sink and I find they can be used in so many places – and are easy to wipe and keep clean! Heading back over to the table. 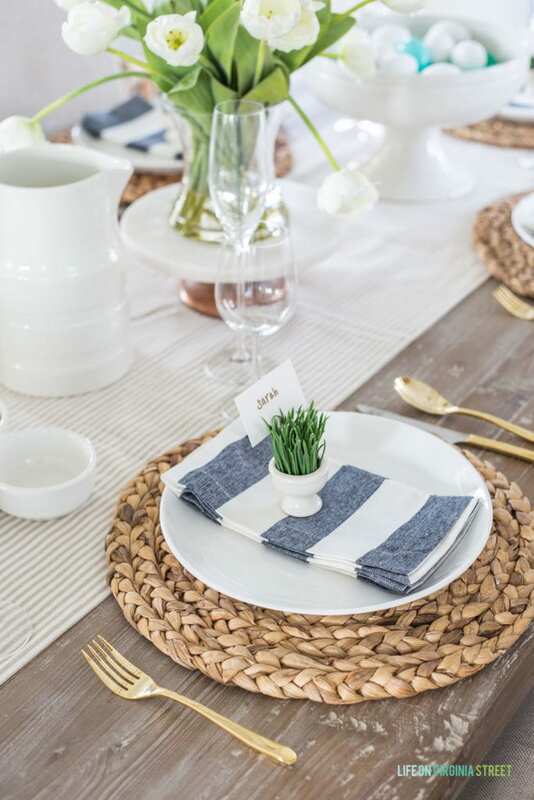 These cute little grass place card holders are one of my favorite finds this season! Sadly I think they’re already all sold out. But hopefully some of you were able to snag them when I shared them in my Wednesday Watch List a few weeks ago! Following are a few other cute options you could use. Click any of the images to learn more about each item. I love the subtle stripe details on this white ceramic pitcher! It comes from the same line as the footed bowl and the three-section condiment server. I love how timeless and seasonless they all are! The striped table runner is a long-time favorite. It’s one of the few I’ve ever found that is long enough to cover the length of our table, plus hang down a bit on each side! I used these water hyacinth chargers that I’ve had for a few years now. They’re one of my go-to’s in every table setting! I love the texture and warmth they add to the table! I’ve also had these striped napkins for several years and find they work for me during any season! When I bought this footed serving bowl, I actually bought it for our kitchen to hold fresh produce. But it also makes a great serving piece for salads, rolls, and more. 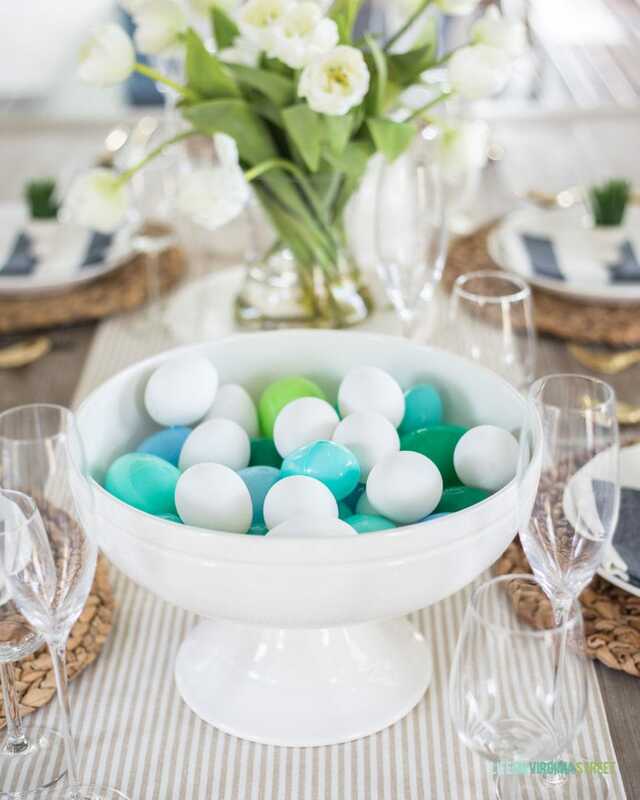 I filled my with faux Easter eggs for the tablescape. The faux tulip arrangement was a recent find from HomeGoods. It looks really life-like, and I don’t have to worry about the cats eating it! It wasn’t quite as tall as I wanted for this tablescape, so I simply propped it up on a cake stand I already had (also from HomeGoods a year or so ago). I still think this view is one of my favorites now! Ever since our kitchen renovation, the window (along with the other kitchen updates) has completely transformed this angle! So much more natural light and sunshine. Perfect for the warmer days ahead! I’ve linked all of our dining room sources at the end of the post. 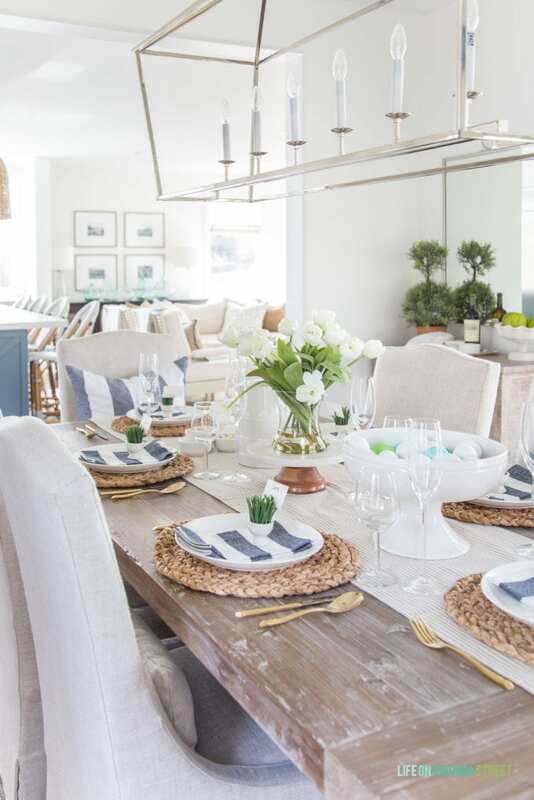 But, If you’re looking for even more Easter and spring decor inspiration, be sure to check out the following posts by clicking on any of the names. I hope you enjoyed this year’s simple striped Easter tablescape! Your Resurrection Day table is beautiful, clean and fresh! Beautiful! So springy and fresh. I agree, that is such a great view from the dining room into the kitchen. 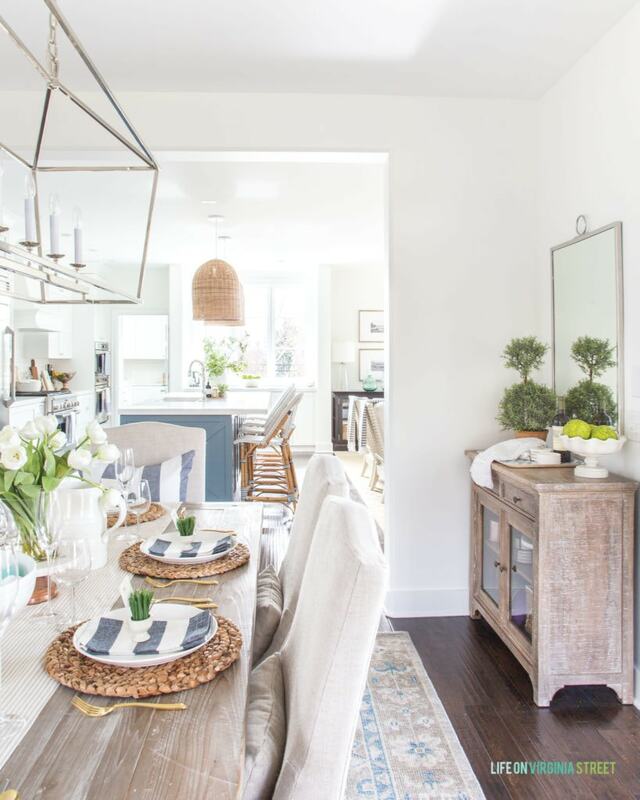 Gosh, don’t you think that your kitchen remodel was the greatest thing ever! 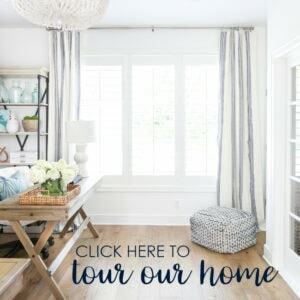 Changed the whole dynamic of your beautiful home!